The Colorpoint Shorthair cat, while a separate breed, is related to the Siamese. This cat is distinguished by its availability in 16 different "point" colors beyond the four Siamese colors. The body color should be free of shading or marking and is a variation of white. 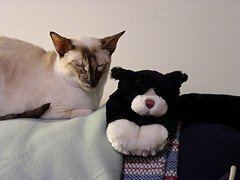 Much like their relatives the Siamese, Colorpoint Shorthairs require very little grooming and are a good choice for households with allergies to cats since they have very little dander. An occasional bath, air dry and regular brushing is all that is needed to keep this breed's short, fine textured coat healthy and glossy. These cats love human companionship and want to be constantly involved in everything. Not really a lap cat, this breed will none the less follow their humans everywhere and will always be close by to lend a helping paw to any occasion. Loneliness can be a problem, so if you have to leave him for long periods, it is best to provide a companion if possible. A pair of these lovelies works very well to assuage boredom and helps to keep them happy and playing with each other. The Colorpoint Shorthair cat is a medium sized breed. This svelte, delicate looking cat is surprisingly muscular. These cats meet the same structural standard as the Siamese. The only difference is in their unique point colors. Blue eyes are the only accepted color, the more vivid, the better. Long, fine boned legs and a long, whippy tail accent the overall long lean lines of this breed. Though one might initially dismiss this elegant and somewhat haughty looking breed as just another pretty face, more independent than playful, nothing could be further from the truth. Colorpoint Shorthairs are actually a fun loving, playful and inquisitive breed who are always able to make their own fun. Any paper bag, crumpled piece of paper or unattended purse becomes an instant toy. Very much supervisors of their territory, they will inspect all areas that they have access to on a regular basis and if something is moved even a little, it will need to be most thoroughly inspected again! Although this may sound like the Colorpoint Shorthair cat keeps himself too busy to hob-nob with humans, that is not the case. Colorpoint Shorthairs love their humans and will try to involve themselves in any and all activities, so as to not be left out of anything. They not only desire a lot of attention, they truly do need it to thrive. These cats are happiest when they are the beloved center of attention with lots of activity to keep them busy.